The corresponding author Anne Schmitz is an Assistant Professor in the Engineering and Technology Department at the University of Wisconsin-Stout. Joint forces are used as surrogate measures for joint osteoarthritis. These joint contact forces are difficult to measure, and therefore, are calculated using either a serial or cosimulation approach. In both strategies, a detailed joint model and multibody dynamics model are used in tandem to calculate muscle forces. These muscle forces then contribute to the joint contact forces. Computed muscle control (CMC) is an algorithm that utilizes a proportional-derivative controller, static optimization, and forward dynamics to calculate muscle activations, which are used to subsequently calculate muscle forces. The goal of this study was to compare CMC accuracy across different movements. Instrumented motion capture data (kinematics, kinetics, and electromyography (EMG)) of a representative subject was used from a previous study. In this study, subjects walked, race walked, and ran at a self-selected pace across a walkway with embedded forceplates while marker trajectories and EMG were collected. Muscle actuated forward dynamics simulations (i.e. CMC) were created for each movement. The muscle activations resulting from these CMC simulations were compared to the experimentally measured EMG by performing a cross-correlation. The CMC results were fairly accurate across all muscles (gluteus medius, rectus femoris, vastus lateralis, adductor longus, semitendinosus, tibialis anterior, gastrocnemius, peroneus longus) with correlation coefficients greater than 0.5. There was no apparent relationship between movement type and coefficient. Future work is needed to determine if correlation coefficients of 0.5 are accurate enough for studies looking to accurately quantify joint contact forces. Sharma, L., Hurwitz, D. E., Thonar, E. J., Sum, J. A., Lenz, M. E., Dunlop, D. D., Schnitzer, T. J., Kirwan-Mellis, G. and Andriacchi, T. P., 1998, "Knee adduction moment, serum hyaluronan level, and disease severity in medial tibiofemoral osteoarthritis," Arthritis Rheum, 41(7), pp. 1233-1240. Andriacchi, T. P., Mündermann, A., Smith, R. L., Alexander, E. J., Dyrby, C. O. and Koo, S., 2004, "A framework for the in vivo pathomechanics of osteoarthritis at the knee," Annals of Biomedical Engineering, 32(3), pp. 447-457. Koo, S., Alexander, E., Gold, G., Giori, N. and Andriacchi, T., 2003, "Morphological thickness in tibial and femoral cartilage are influenced by gait characteristics in healthy and osteoarthritic knees," Proceedings of the 2003 ASME Summer Conference, Miami, FL. Vincent, K. R., Conrad, B. P., Fregly, B. J. and Vincent, H. K., 2012, "The pathophysiology of osteoarthritis: a mechanical perspective on the knee joint," PM&R, 4(5 Suppl), pp. S3-9. 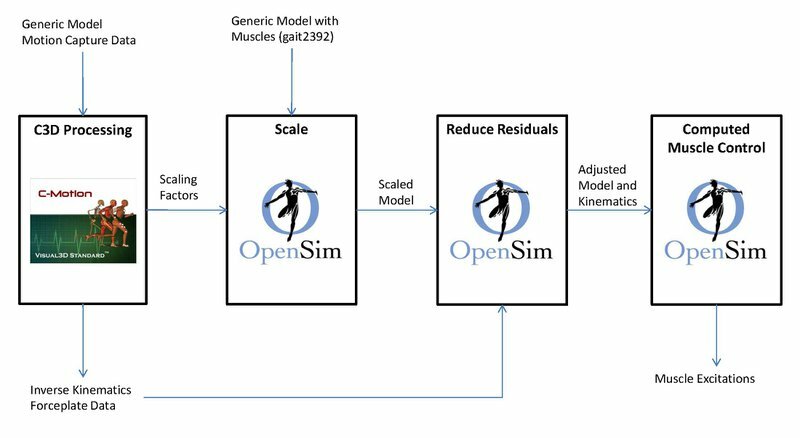 Schmitz, A. and Piovesan, D., 2016, "Development of an Open-Source Cosimulation Method of the Knee," 38th Annual International Conference of the IEEE Engineering in Medicine and Biology Society (EMBC). Shelburne, K. B., Torry, M. R. and Pandy, M. G., 2005, "Muscle, ligament, and joint-contact forces at the knee during walking," Medicine & Science in Sports & Exercise, 37(11), pp. 1948-1956. Thelen, D. G. and Anderson, F. C., 2006, "Using computed muscle control to generate forward dynamic simulations of human walking from experimental data," Journal of biomechanics, 39(6), pp. 1107-1115. Lin, Y.-C., Dorn, T. W., Schache, A. G. and Pandy, M. G., 2012, "Comparison of different methods for estimating muscle forces in human movement," Proceedings of the Institution of Mechanical Engineers, Part H: Journal of Engineering in Medicine, 226(2), pp. 103-112. Mokhtarzadeh, H., Perraton, L., Fok, L., Muñoz, M. A., Clark, R., Pivonka, P. and Bryant, A. L., 2014, "A comparison of optimisation methods and knee joint degrees of freedom on muscle force predictions during single-leg hop landings," Journal of Biomechanics, 47(12), pp. 2863-2868. Hamner, S. R. and Delp, S. L., 2013, "Muscle contributions to fore-aft and vertical body mass center accelerations over a range of running speeds," Journal of Biomechanics, 46(4), pp. 780-787. Anderson, F. C. and Pandy, M. G., 2001, "Dynamic optimization of human walking," Journal of Biomechanical Engineering, 123(5), pp. 381-390.
. However, since these studies were conducted independently, the relationship between movement type and muscle activation accuracy cannot be ascertained. Therefore, the goal of this study was to determine the relationship between CMC accuracy of muscle activations and movement type. 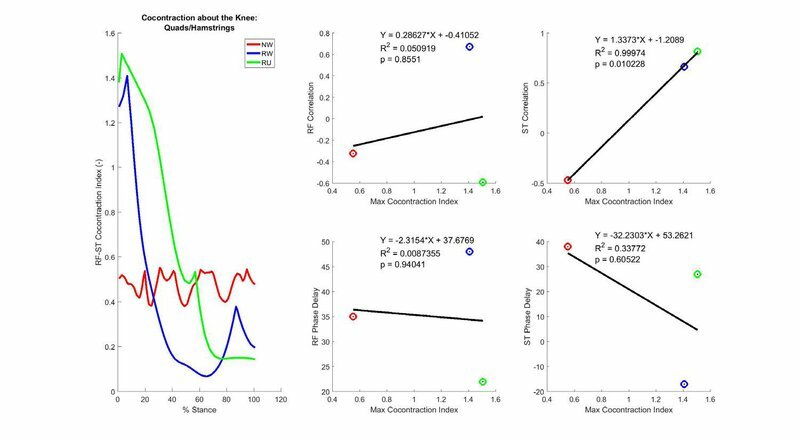 This is an important step in determining the limits of CMC to accurately predict contact forces for use in osteoarthritis prevention, progression, and eventual treatment simulations. Norberg, J. D., 2015, "Biomechanical analysis of race walking compared to normal walking and running gait," PhD thesis. University of Kentucky. Delp, S. L., Anderson, F. C., Arnold, A. S., Loan, P., Habib, A., John, C. T., Guendelman, E. and Thelen, D. G., 2007, "OpenSim: open-source software to create and analyze dynamic simulations of movement," IEEE transactions on biomedical engineering, 54(11), pp. 1940-1950. C-Motion, 2018, Visual3D to OpenSim (online resource). , muscle actuated forward dynamics simulations were created for each movement (Fig. 1). Figure 1: Flowchart of the Visual3D to OpenSim pipeline used to create muscle-actuated forward dynamic simulations of movement. These simulations calculate the muscle excitations needed to achieve an experimentally measured motion. Schmitz, A. and Norberg, J., 2016, "The Sensitivity of Joint Torques During Running to Forceplate Data Error," Journal of Dynamic Systems, Measurement, and Control, 138(11), pp. 111001. Schmitz, A., 2008, "Accuracy of Six Degree of Freedom Joint Kinematics and Kinetic Measures During Normal and Pathological Gait: A Simulation Study," MSc thesis. University of Wisconsin-Madison.
. The generic model in Visual3D and OpenSim were the same in segments used and joint models. However, the OpenSim model additionally contained muscle actuators. Then, the residual reduction algorithm (RRA) was used to create a dynamically consistent system (e.g. Almonroeder, T., Willson, J. D. and Kernozek, T. W., 2013, "The effect of foot strike pattern on Achilles tendon load during running," Annals of biomedical engineering, 41(8), pp. 1758-1766. Erdemir, A., McLean, S., Herzog, W. and van den Bogert, A. J., 2007, "Model-based estimation of muscle forces exerted during movements," Clinical biomechanics, 22(2), pp. 131-154. ). Since the number of muscles is greater than the number of joints, the redundant system is treated as an optimization problem. The muscle excitations needed to achieve the overall joint accelerations is determined using the induced acceleration results and by minimizing the summed excitation across all muscles. Nelson-Wong, E., Howarth, S., Winter, D. A. and Callaghan, J. P., 2009, "Application of autocorrelation and cross-correlation analyses in human movement and rehabilitation research," Journal of Orthopaedic & Sports Physical Therapy, 39(4), pp. 287-295. Palmieri-Smith, R. M., McLean, S. G., Ashton-Miller, J. A. and Wojtys, E. M., 2009, "Association of quadriceps and hamstrings cocontraction patterns with knee joint loading," Journal of Athletic Training, 44(3), pp. 256-263.
. Linear regressions were then used to quantify the relationship between CMC accuracy (i.e. maximum correlation coefficient, phase delay) and movement type (maximum cocontraction index). The maximum cross-correlation coefficient between the calculated muscle excitations and experimentally measured EMG were greater than 0.5 for walking, race walking, and running (Fig. 2). 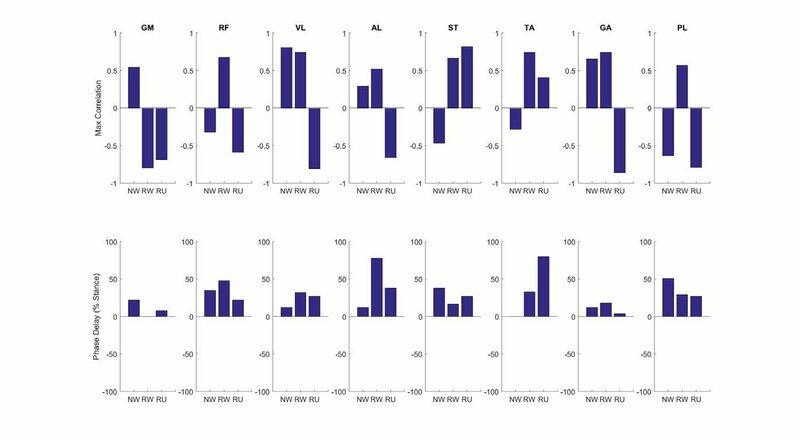 The maximum correlation coefficients averaged across all muscles were 0.5 for normal walking, 0.68 for race walking, and 0.7 for running. The phase delay averaged across all muscles was 22% stance for normal walking, 32% for race walking, and 28% for running. The time traces of the calculated muscle excitations, measured EMG, and cross-correlations can be found in the supplemental information. Figure 2: The maximum cross-correlation coefficient and phase delay between the calculated muscle excitations and measured EMG for all three movements: normal walking (NW), race walking (RW), and running (RU). As movement difficulty increased with more knee cocontraction, there was no significant relationship between cocontraction and rectus femoris correlation (p = 0.86), rectus femoris phase delay (p = 0.94), or semitendinosus phase delay (p = 0.61) (Fig. 3). Although, as cocontraction increased, the maximum semitendinosus correlation coefficient did significantly increase linearly (p = 0.01). Figure 3: The relationship between rectus femoris/semitendinosus cocontraction and the maximum cross-correlation coefficient (i.e. accuracy of simulation to calculate EMG). Joint forces are an important variable of interest when studying joint degeneration, specifically osteoarthritis. To calculate these contact forces, muscle excitations and consequently muscle forces must able be calculated. Therefore, the accuracy of joint forces is dependent on the accuracy of these muscle excitations. Muscle excitations are calculated using a computed muscle control (CMC) algorithm consisting of a proportional-derivative controller, static optimization, and forward dynamics. This framework has been verified by comparing calculated muscle excitations to experimentally measured EMG. Although, this has been done for a limited number of movements. 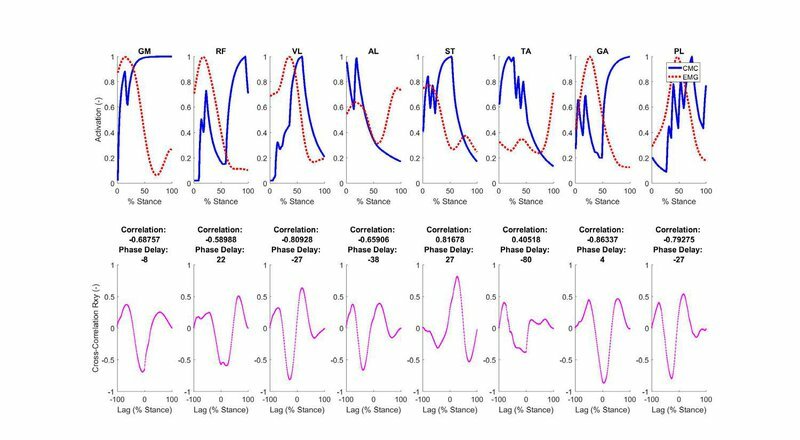 This study has expanded on the literature by evaluating the performance of the CMC tool in predicting muscle excitations for movements of varying complexity: walking, race walking, and running. Surprisingly, the CMC tool calculated excitations in reasonable agreement with EMG, regardless of movement complexity (Fig. 2 – Fig. 3).
. CMC uses static optimization where the summed muscle excitations across all muscles is minimized. This cost function cannot mathematically account for cocontraction. However, the coordination of walking, race walking, and running may not be true cocontraction. For example, to produce knee flexion, the CMC algorithm would activate the hamstrings (Fig. 4). If hip flexion accompanies this knee flexion, CMC would also activate the rectus femoris (Fig. 4). This coordination of a biarticular muscle would show up as cocontraction. 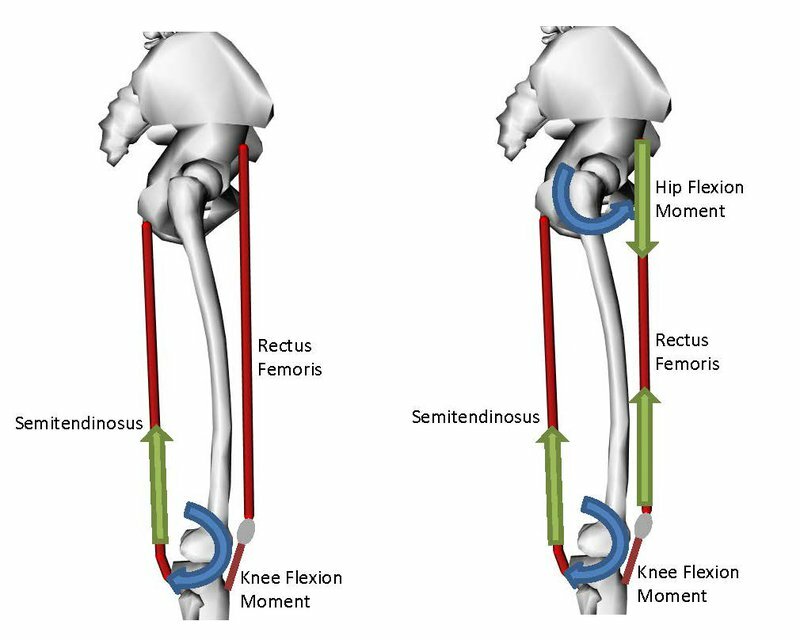 Figure 4: (left) To produce knee flexion, CMC would activate the ST. (right) If knee flexion and hip flexion are concurrent in the motion, CMC would activate both ST and RF. This coordination may appear as cocontraction. ). While this is occurring, a hip flexor moment is created by the rectus femoris to bring the leg forward for initiation of stance phase. Similarly, as the foot comes off the ground (i.e. 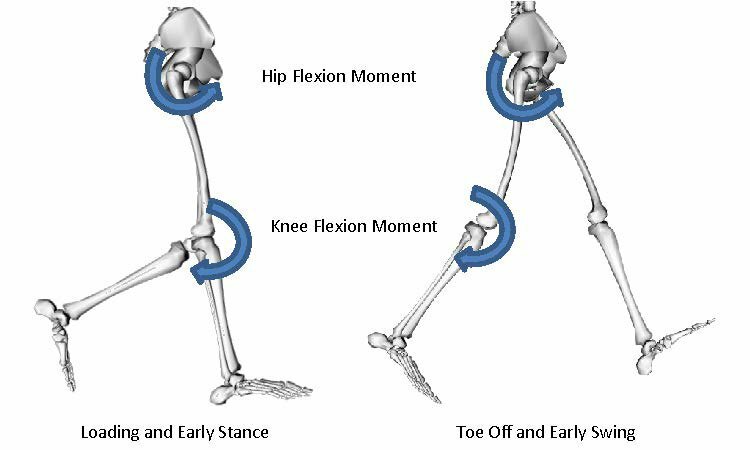 toe off) during early swing, the hip joint moves from hip extension to hip flexion creating a hip flexion moment and the knee joint moves from knee extension to knee flexion creating a knee flexion moment to prepare for the next contact (i.e. heel strike). These events occur simultaneously where the hamstrings and the rectus femoris, all of which are biarticular muscles, are producing muscle activity at the same time to produce cocontraction. Figure 5: Hip flexion and knee flexion occur simultaneously during early stance and early swing in walking, race walking, and running. There are some study design choices to consider when interpreting the results of this study. First, only knee cocontraction was considered. Hip and ankle cocontraction was not considered since the muscles at these joints require indwelling EMG electrodes. This was beyond the scope of the initial study. Second, the same optimization strategy was used for all three gaits where the sum of muscle activations squared (i.e. muscle energy expenditure) was minimized in calculating muscle activations. It is unclear if the same coordination strategy is truly utilized during all three movements in vivo; although we would expect the same results if various optimization strategies were used for each movement (i.e. the effect of biarticular muscles on knee and hip coordination). In summary, we have used the CMC framework to calculate muscle excitations for walking, race walking, and running. The results show these excitations agree fairly well with measured EMG, regardless of the motion. We theorize CMC can calculate muscle cocontraction patterns for biarticular muscles, although not for uniarticular muscles since CMC uses a static optimization tool. This is an important first step in determining the usefulness of CMC to be used in simulations calculating joint contact forces for osteoarthritis simulations. The next step is to determine if the correlations found in this study are accurate enough to calculate reasonable joint contact forces. Computed muscle control. An algorithm, which includes a proportional-derivative controller, used to calculate muscle forces. Electromyography. Measurement of muscle excitations. Residual reduction algorithm. Used to make dynamically consistent simulations. Experimentally measured EMG and calculated muscle excitations are a function of time. To quantify the relationship between these time varying signals, cross-correlation was used. 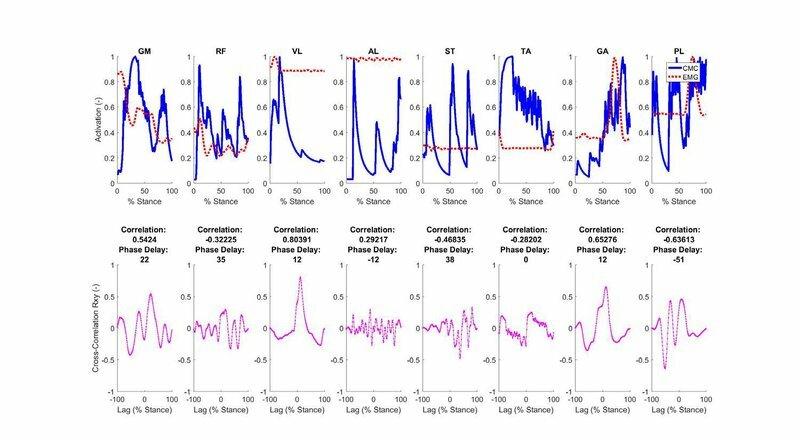 To present a complete picture of the time varying data, plots of the calculated muscle excitations, measured EMG, and cross-correlation are included for walking (Fig. S1), race walking (Fig. S2), and running (Fig. S3). 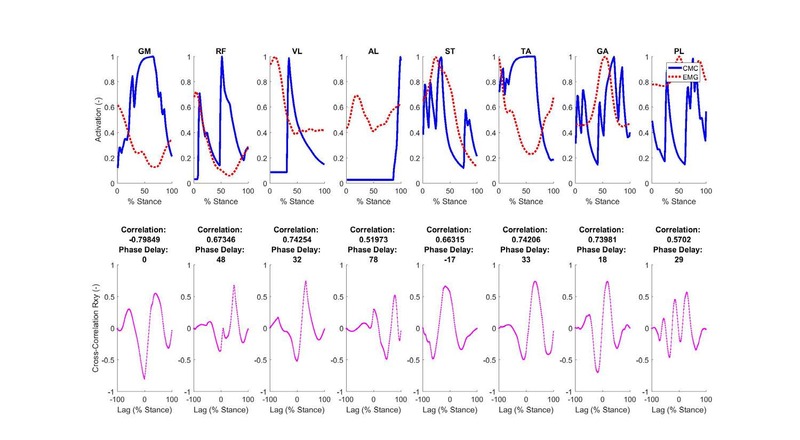 Figure S1: The time-varying data for calculated muscle excitations and experimentally measured EMG (top) were compared using cross-correlation (bottom) for normal walking. Figure S2: The time-varying data for calculated muscle excitations and experimentally measured EMG (top) were compared using cross-correlation (bottom) for race walking. Figure S3: The time-varying data for calculated muscle excitations and experimentally measured EMG (top) were compared using cross-correlation (bottom) for running.